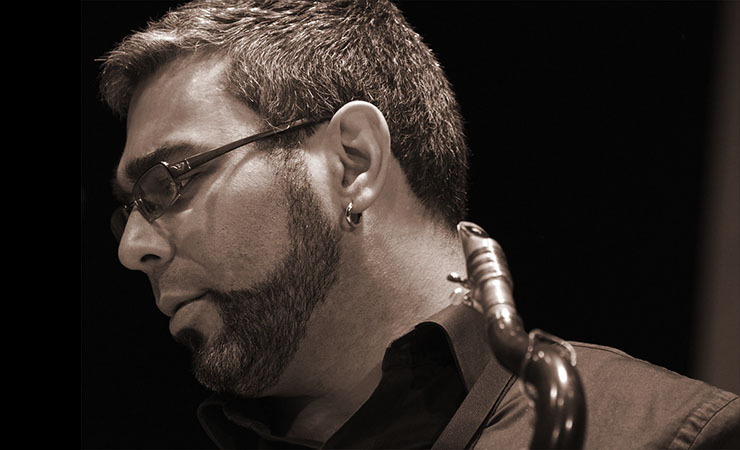 A native of São Paulo, Brazil, Dr. Felipe Salles is an Assistant Professor of Jazz and African-American Music Studies at the University of Massachusetts Amherst since 2010. Being an active musician in the US since 1995, he has had the opportunity to work and record with prominent jazz artists like Randy Brecker, David Liebman, Lionel Loueke, George Russell, Gunther Schuller, Sam Rivers, Herb Pomeroy, Jerry Bergonzi, Jovino Santos Neto, Oscar Stagnaro, Duduka Da Fonseca, Maucha Adnet, Tony Lujan, Luciana Souza, and Bob Moses. Raul da Gama, on his review of Ugandan Suite wrote: “Few practicing musicians in the Jazz idiom have perfected the composition of a suite in the manner that the great Duke Ellington did in his lifetime… …Felipe Salles may be young at this art and might have composed just two suites to date, but he shows every bit of skill, musical intellect and, indeed much ingenuity at this form of music. First there was his South American Suite (2007) and now there is the uniquely complex and utterly exquisite Ugandan Suite. But why Uganda? Why East Africa? Felipe Salles answered to those questions and expanded on other topics related to his latest project on the following Q & A.
LJN: You travelled to Uganda on a research trip in 2011, investigating Ugandan music and native wildlife. What motivated you in the first place? What sparked your interest in that East African nation? FS: I have always been interested in visiting Africa, especially after playing African music during my years in Boston with Kenyan singer and songwriter Eric Wainaina. Lionel Loueke was also part of this band… My interest in going to Uganda was sparked by an invitation to be a visiting scholar and do some voluntary teaching work. Uganda being a neighbor nation to Kenya, I started researching their traditional music, and was surprised to see how different it was from other African music I was familiar with, which made me even more excited to do some real field research. It took me a few years to be able to get a grant to fund this trip, because traveling to Africa is very expensive. LJN: Bringing together jazz, classical and African music, making use of Ugandan musical idioms is certainly a pioneering enterprise that marks a breakthrough in your artistic development. Please tell us about the conceptual process. How did you come up with the ideas? How did you elaborate the project? FS: Thanks. When I got to Uganda, it was a cultural shock at first, to say the least, but I guess many years of travel and my Brazilian heritage were very helpful in acquiring the necessary flexibility to travel around the country, specially the countryside. I have always utilized jazz and classical music as part of my compositional palette, along with Brazilian music, which is native to me. In 2007 I recorded South American Suite, which had a similar concept, but, back then, focused on Brazilian rhythms. I knew that the Ugandan experience would inspire me somehow, and after seeing the nature, the wild life and being exposed to the music, it was clear to me that all those elements would have to merge somehow in a piece of work. I draw a lot of inspiration from thematic and programmatic ideas. It helps me direct my creative process. When I was hanging out with some local musicians, I heard a beautiful song and was later told it was about the “big five”, the most powerful animals of Africa. That idea made an impression on me and later inspired me to write the suite. It was clear to me that each animal would have a personality, which had to be expressed by melody, mostly inspired by Ugandan folk melodies, by harmony, mostly jazz inspired, and by rhythm, obviously in abundance in Ugandan traditional music. I collected many hours of recordings and footage, as well as CDs, DVDs and pictures, during the trip. Many hours of transcription and notation were necessary to organize this material before I could even start writing the piece. LJN: The choice of musicians was certainly a major component in making this project a reality. I recognize some of your long-time collaborators. Please tell us about the great talent you gathered to make Ugandan Suite. FS: I am lucky enough to have a steady band: Nando Michelin on piano, Bertram Lehmann on drums and Keala Kaumeheiwa on bass. I have wanted to collaborate with David Liebman for many years. I had written a symphonic piece for him as a soloist in 2005, but due to scheduling problems, he was not available to do it when the concert date was set. His work with drummer Elvin Jones was always an inspiration during my formative years, so I thought that this early connection to Elvin’s African approach to jazz would make him a great addition to the project. After that it was very important to bring in a great Ugandan musician who could understand the roots of this work and make sure that we could honor this music, and that was Damascus Kafumbe. Damascus is not only a master multi-instrumentalist, but also an important ethnomusicologist. He came highly recommended by a colleague of Bertram’s. Bertram is an ethnomusicologist himself, with deep knowledge of African music. I could have not asked for better! Off course, to top it off, Brazilian percussionist Rogerio Boccato, and old friend and collaborator on South American Suite, was brought in to make jazz, African and Brazilian music come full circle. You could call this the dream team of world music. LJN: Music and wildlife go hand-in-hand on Ugandan Suite. Each movement represents an animal, you make use of rhythms and musical styles from specific regions of the country, and you make use of a richness of musical elements and instruments to infuse those forceful entities with life and energy. How challenging was all this creative process? Please tell me a bit about each track. FS: Having a theme or an idea behind a composition actually helps me focus my energy and creative process. I tried to picture each animal’s personality and what I wanted to represent through music as if it was an unfolding story. I spent hours going over the transcribed material from my recorded archives and they served as inspiration for the rhythmic and melodic frames. Jazz harmonies and improvisation were added to the mix as I saw it fit. The first movement is “The Buffalo” and it depicts the animal and its serene nature, letting a bird clean its back as it rests in the savanna. The animal also has another side, a more violent one, ready to charge if necessary. The second movement, “The Elephant”, depicts the animal through the baritone saxophone. The tube fiddle inspires its melody, and it plays around with some classical minimalistic compositional concepts used by Reich. The third movement, “The Leopard”, was inspired by the bow harp orchestras’ music, and it depicts the animal’s grace and agility. It is a dance party and reconnects African roots and Brazilian baião. The darker fourth movement, “The Rhinoceros” was inspired by the dark and aggressive character of the animal, its incredible force and power, and by Liebman’s work with Elvin Jones, a rhinoceros of a drummer. It is a two-tenor battle over a bed of intense drumming. The fifth and last movement, “The Lion” depicts the animal’s majestic personality through a complex relationship between the rhythm, harmony and melody. It is also a commentary on Uganda’s youth disregarding their musical tradition and their adoption of American hip-hop and R&B. This is a rough description… music here works better than words, in my opinion. LJN: Absolutely. You were able to find points of connection and elements in common among the different musical components you used to create Ugandan Suite. And you make the final product sound seamless and very organic. Please expand on this topic. FS: I am glad you feel this way about the result. There are themes that reappear, although not in the same exact way, throughout some movements… Most melodies have pentatonic qualities that create a sense of familiarity, and the harmonic concept I used to expand the folk material also creates compositional unity. The core of the suite, the Ugandan rhythms, have lots of common denominators, like the triplet feel, mostly in 6/8 and 12/8, yet can be strikingly different in character according to regional variations. Having a band that plays together and understands my personal style as a composer can also make the result sound seamless. In fact, many of the changes that were suggested by the musicians, in the process of rehearsing this music, contributed to this. I am very lucky to be able to work with talented musicians who are willing to explore my music and take the time to make it even better.